Not a super tailor myself, but I find that having a (manageable) hoard of random fabric can help a lot. If I get ahold of something that’s too beat up for Goodwill, I’ll cut out the usable parts and hold on to them, and then use it to repair or add to something else. Mainly works for patches… I’ve also made a few pillows out of tee shirts that were getting waaaaay too old to wear anymore. I imagine you could do a cool bohemian look with something crazy-patchwork. Thank you for the encouragement!! I hadn’t thought of Etsy vs patterns, but that sounds like a great idea. 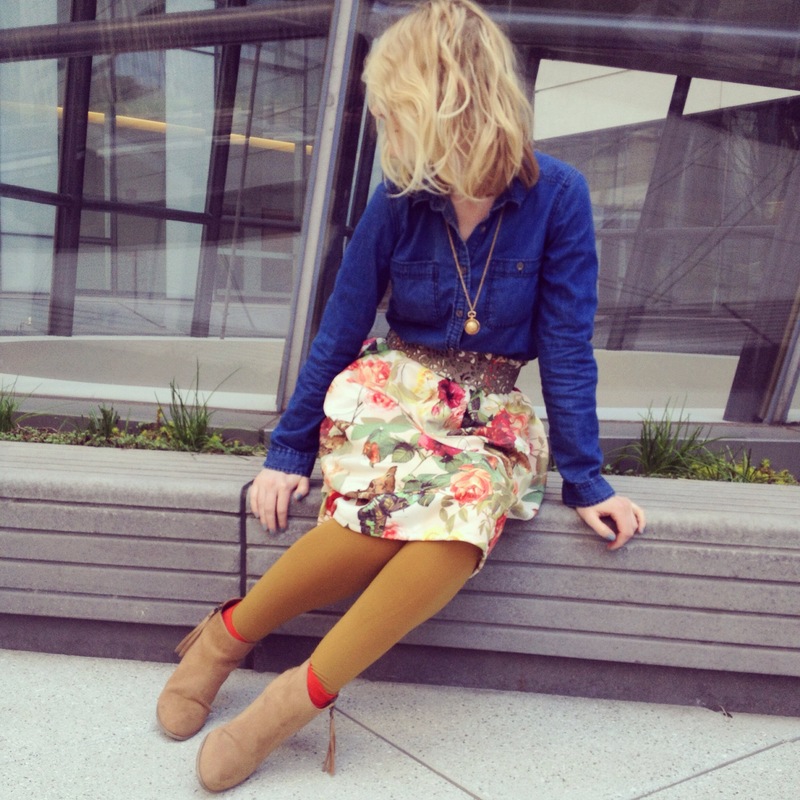 I had to talk myself through whether my skirt was okay/blog worthy too. We are always our toughest critics, right? But, you have to start somewhere-! Keep us posted on your future creations- I would love to see them! Love the skirt! Good job! I’ve been toying with trying to sew. I have a sewing machine and have never used it. depending on the body shape, a top could also be as cheap & easy to make as a skirt. since i’m practically flat-chested, if i want to make a quick top i would only need around 60 – 70 cm of fabric, depending on how long i want it to be. then all i have to do is cut the fabric in the middle (between the selvages), sew the neck holes (front and back separately), sew the shoulder seams, sew the side seams up to where the arm holes are supposed to be, and sew the arms holes and hem. DONE! 🙂 this works best with lightweight jersey/knit fabrics, very light cotton (lighter than the regular quilting/JoAnn fabrics), or viscose (my fave kind of fabric!). YAY! Great tips!! I really need to look into thrifty fabric stores and I think looking at places like resale shops makes perfect sense!! I am definitely going to try that!! Thanks so much! Beautiful skirt! Well done and great job! Don’t worry if from first time it’s not like you expected, I’ve been sewing for around 10 years, I just stopped it and do only occasionally for last 4 years since my Mum passed away ( I lost inspiration) I used to sew even coats and jackets. You can upload patterns online or buy them and believe hem line is pain in the… even with patterns:))) For first time try to buy simple fabric I mean not sleepy or stretchy fabrics like silk, chiffon – they are highly difficult to make pattern, to sew them it needs to have special needles special stitch and special paper to put under fabric, but if you love doing this with time it will be only better and better! Good luck! Thanks for sharing, Oxana. For a long time, I stopped sewing. I think I just lost that part of me that likes to create things, so I could definitely see how a loss would contribute to that feeling. I would love to see some of your creations and love your feedback and tips 🙂 thanks again for sharing- you inspire me everytime you post! I so respect you for sewing the skirt yourself!!! That takes patience and skill, for sure. It turned out so lovely, too! Ok, I knew there was a reason you were this good..you are a seamstess as well!! Woohoo..you nailed it. From afar the structral issues if any are not noticable atall. I have thought so many times to sew some clothes, but I am best at hand embroidery, the old woman kind, that my mom taught me as kid. But I digress, love the print, and with the belt, this skirt looks amazing!! So proud of you..and thank you for the inspiration. More reasons why the shoutout to you on my blog is pertinent! woot woot. I like it and I love the skirt, great outfit. Yes! I need to sketch out my projects a bit more for my prep, but I’m learning bit by bit! Thank you for showing all of us dedication to the arts! Wow… I am super impressed with your sewing skills! That skirt is super fabulous! Reading your post reminded me of your grandmother Ann laying her patterns on the floor and pinning the material to them. She made a lot of her own clothes. Nice memories. The fabric is beautiful. Great job on the skirt. I’m excited for you and all your future projects. Love your fearlessness and the fact that you just go for it and make it happen. Thank you so much! Your sewing really inspired me to just go for it and try. I figure worst case scenario, I can just scrap the project and move on 🙂 so thank you for the inspiration! Nice!! Thanks for the tip! I need to look into that and then visit! Sounds like it would be perfect- thanks again! You look amazing! And A DIY!??? 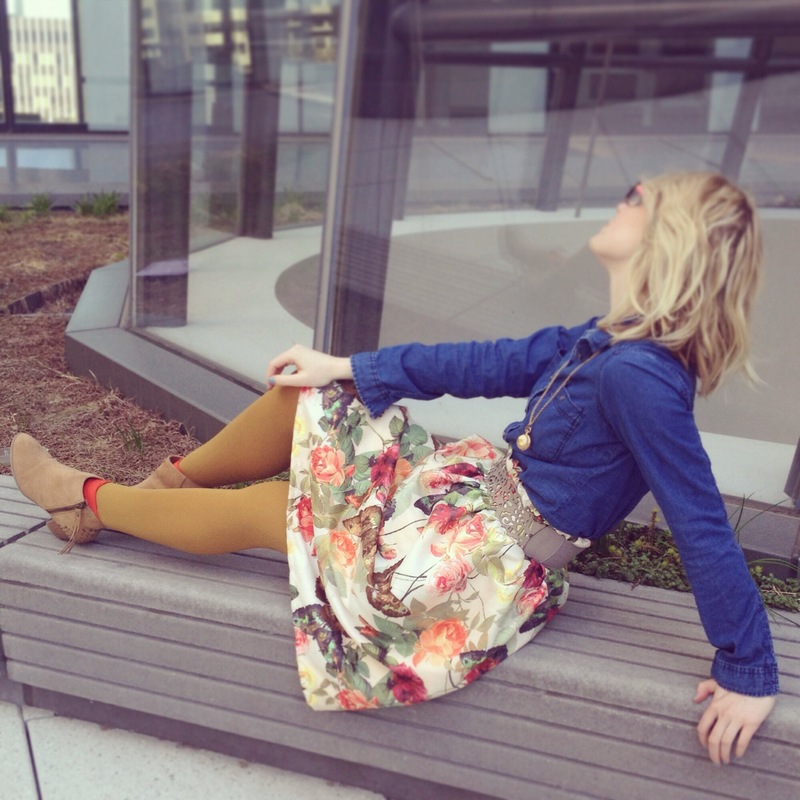 Fabulous skirt, it was the first thing that caught my eye in this outfit! 😀 Well done you!! Eeee this whole outfit! This skirt is amazing! It was the first thing I noticed. Great job girl! Love this and would totally but it in a heartbeat if I passed it in store! You sound like me, patterns…directions… meh technicalities that are just a hassle;). 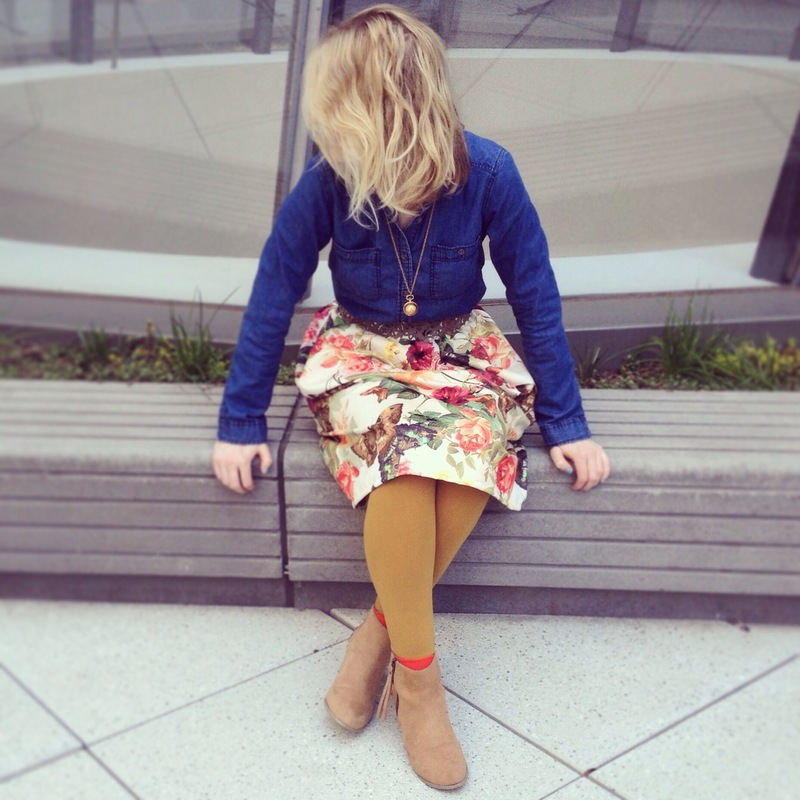 I love this skirt , so, so cute , these buttrflies and flowers took my mind ! 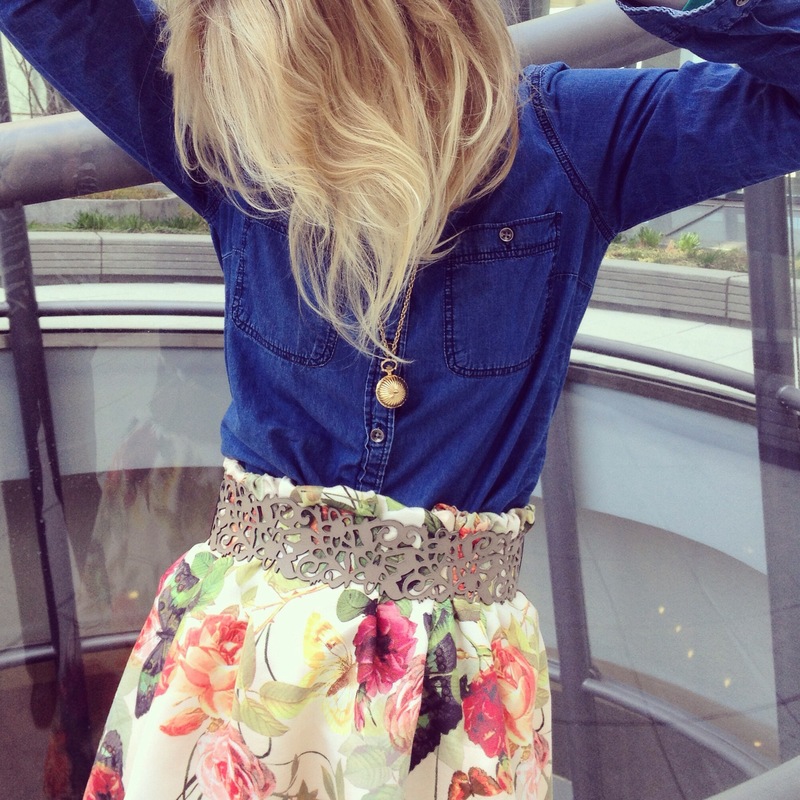 Great idea and …..cool denim shirt. Love the skirt!!! You’re a doll!!! 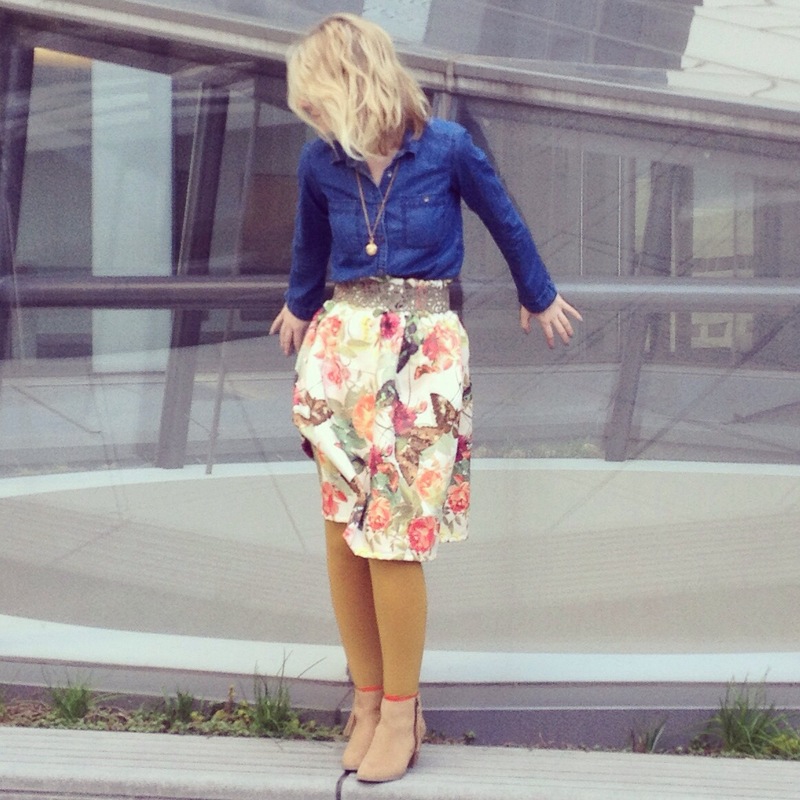 The fabric for that skirt is adorable & with the belt–love!